This was one of four designs I made for a client named François to fit an "oeil de boeuf" ("ox eye") window in his carefully restored farmhouse in southwest France. These handsome openings, often hewn out of a single piece of stone, are typical features of barns and houses in southern France and originally served as ventilation for the grain, hay or stock that were kept inside. The motif was suggested by François and shows a Cathar Cross and a plumed hat representing the musketeers. The Cathars were a Christian sect whose ideas put them so much at odds with the Catholic Church that they were eventually annihilated by a crusade launched against them in the 13th century. D'Artagnan, one of the musketeers in the famous Dumas novel, was based on a real person whose statue stands in the county town of Auch. The character has now come to stand for the Gascon spirit, with its values of courage, honesty and daring. The blue and white shield in the centre was the crest of a nearby village where my client was the mayor. I spend about half of each year in my farmhouse in southwest France and the rest of the time in London. I developed the design in London, so I would sketch it out using Glass Eye 2000 and then export the image and send it as an email attachment to France. At times I used the text feature to insert comments on parts of the design. This way it was clear what I was asking François to decide about — a lot more effective than monochrome faxes or waiting for the post. There had to be compromises, of course. 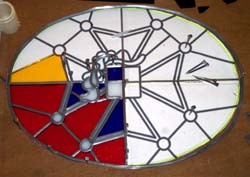 The shield had four panels each with a small motif (for example, one had a lion) and François commented in his reply to the first design that he would like to see these on the panel. When I explained that each square was less than two square centimeters he readily accepted that this would not be feasible! I had cardboard templates of the window openings to help me design. None of the these openings were perfect ellipses and this caused me some problems at first. On some of the designs, I started with Glass Eye 2000 ellipses and then tweaked them in an attempt to fit the template. I also tried photographing the template and then importing the image as a Glass Eye 2000 background, but the resulting pattern never quite fit the template due to lens distortions. The solution was to import scanned templates, which captured the shapes perfectly. That said, the version of the pattern I have provided here is a perfect ellipse. The panel was constructed with leaded glass because it needed to be weatherproof. The detail of the hat and its plume was tricky to cut and assemble. Of course, the smaller the pieces the more work there is applying and cleaning cement. I'm always surprised how, in the end, even the tiniest sections of glass make a big contribution to the final effect and are worth the effort that's needed to construct them. Another issue in putting together the piece was its shape. I've mostly worked on square or rectangular panels, constructing them against a pair of batons set at right angles and then using stainless steel horseshoe nails to hold the work in place against them. As each of the four pieces had a slightly different template, I didn't think it worthwhile making four different custom formers so I just used the nails all round (see middle picture above) which seemed to work well. 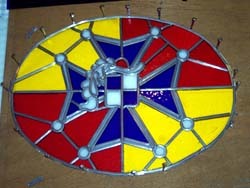 David has been working with stained glass for about ten years and using Glass Eye 2000 for more than five. He was head of a large psychology department in a London college until he retired at age 56 which has left him more time to work on his hobby. Although he hasn't done a lot of commissioned work, the Gascon Cross was ordered after he took part in a French arts and crafts exhibition. 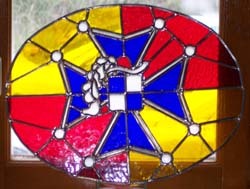 Another spin-off from that exposure was that he has run a few stained glass weekend courses due to visitor requests. You may reach David by email.